In a recent post, Yonah Freemark and Jebediah Reed over at the Infrastructurist lament the loss of 11 once-famous landmark grand stations around the country to strictly utilitarian underground platforms, arenas, office towers, strip malls, highways and parking lots. Case in point: Penn Station in NYC. Fortunately, California has managed to preserve at least some of its own railroad history in the shape of historic passenger stations, e.g. LA Union Station, San Diego Santa Fe Depot, Sacramento's Depot, San Jose's Cahill Street (aka Diridon) station and many smaller ones as well. Built in the age of steam, before freeways, buses and private cars even existed, these buildings remind Californians of the importance of railways in their own history. Now that state voters have approved $9.95 billion in GO bonds to kick-start a rail renaissance, visions of brand-new, ultra-modern stations have become the centerpieces of urban planners' ambitious plans to revitalize city centers and make using public transportation attractive again to a population that has become hooked on gas-guzzling cars. For practical reasons, many of these stations will feature run-through tracks, electronic displays and other aspects of modern rail technology. In particular, the 19th century notion of maintaining waiting rooms separate from the platforms makes little practical sense in the fast-paced 21st century, in which trains run very frequently and on time with just a minute or two of dwell time. be carefully relocated elsewhere for the sake of maximum convenience for passengers at the new transit hubs? What would you prefer in the case of your own city's existing train station, and why? Note: SF's Transbay Terminal is arguably a special case in that it was a station for electric trolleys, then a bus depot and now slated for wholesale replacement to meet seismic code. Since we've already covered the SFTT ad nauseam, I'd like to keep the focus on the issue of architectural/cultural heritage vs. utility where above-ground structures are expected to be preserved. Discussion of what you'd like to see happen at Caltrain's 4th & King property after electrification is of course fair game. What I'd like to see if possible is either having the historic station adjacent to the new station and used as a mini rail museum or integration of the historic station with an expanded modern station. Of course in some cases that may be not be possible, in which case I would suggest relocating the historic station to another location. I think the worst case would be trying to squeeze the modern needs of a rail system into the incompatible footprint/layout of an historic station. In the case of Anaheim, I would love to see something like the rendering above. As for Fullerton, I hope the building remains untouched. Although should it become an HSR station, adding a large canopy over the tracks and expanding the building tactfully would be just fine. Union Station in Los Angeles is an important landmark and I think should remain in tact, but integrated to new modern expansions for HSR. It's one of the few places left in LA where you can walk in and feel a sense of grandeur and history outside of a museum as it is still very much a functional transit hub. I'd love to see it continue to both be a historic landmark while simultaneously continue to be a transportation center for the city. During a board meeting some CHSRA engineers said that the HSR platforms at Union Station would not interfere with the historical portion of the station. He said that if you were standing on Alameda Street looking at Union Station's iconic facade, you would not notice it was an HSR station. Some stations need to be retrofitted for the supreme use of the stations. Union Station for example might not be up to handling over half a million people every day. Stations like that will have to have add-ons. Otherwise, historic stations should be used if possible; if not, build the new stations as near to them to uphold that "image". Trust me, waiting rooms are a good idea. Ideally, there would be enough space on the platforms (with shelters) for all waiting passengers. But in a really big rail station, this will likely not be the case. Waiting rooms also double as commercial areas (food courts) when used properly. Agreed with Anonymous: historic buildings should be integrated into new stations. If the layout is totally incompatible they can be moved. But this isn't needed for LA Union (for instance), or any of the other stations which are already grade-separated from track; these can be integrated into a new station trivially in most cases. I actually have to disagree with the notion that "waiting rooms are outdated". 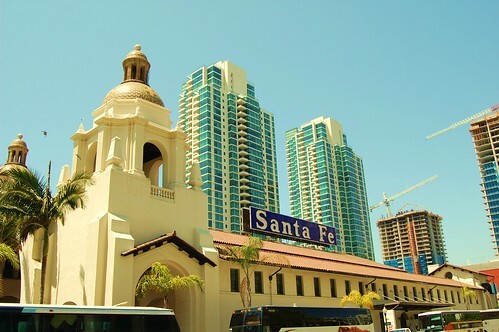 I currently live in San Diego and go through Santa Fe Depot every day while going to the coaster. And the station is not empty, there are plenty of people that are there waiting for the next Amtrak Surfliner. Now that station is a lot larger than it needs to be, but from what I can tell they have leased out most of the space that isn't needed to others. Our rail landmarks are some of the few things in California that we have in terms of history, and it seems unlikely that any, even the smaller ones will be demolished. New stations, heck yeah make them modern. If those old stations can't cope with HSR, update them so they do. Hopefully the new stations are designed to last and in 100 years people can look back on them as the first architecture of our new HSR era. As some examples, both Waterloo and St. Pancras stations in London were reconfigured for new high-speed rail services (Eurostar) without shutting down, demolishing, or moving the existing stations. Manchester's stations underwent an even more startling transformation with the addition of the light rail line, which "breaks out through the back" of one of them. London is reconfiguring Blackfriars now. There is really no reason not to integrate the historic stations into modern station designs in most cases. Waiting rooms are still appropriate...however, the current concept that you must wait in the waiting room until the train comes to a complete stop is outdated and unneccessary. There is no reason why modern train operations cannot take place in a 19th century building. Case in point: St Pancras International, London. Sure, some will need modifications or extensions, but that should be to be done sympathetically. Remember that older stations were deisgned to move large numbers of people between trains and the world outside the station - which is precisely what they'll do with HSR. One of my pet peeves about railway stations is a lack of places to sit down, especially in somewhere protected from the elements. Even with roofs over the entire station, platform areas are never completely cut off from the outside weather. I know LA doesn't see much snow, but people like the option of being able to wait in a lounge area, particularly if they are meeting someone or have longer to wait for a train than expected. Integration of old station elements into the structure and function of the new station is clearly the way to go. As a Giants fan, and an AT&T Park fan, it kills me to say this, but I think the relevant example here is really the beautiful and functional integration of the old metal supply company building into Petco Park: http://twoguysandamap.com/art/petco_3.jpg It's just enough to be a reminder of the history but it fits all the functionality of its modern use. I like to wait on the platform for my train. I hope they don't change LA Union Station so that you have to wait inside and close off the platforms to immediate boardings. A lot of people like to smoke at the south end of the platform anyway. I believe the best concept is what we've listed here is using the old station as your grand entrance leading into new additions. Platform waiting should be permitted but might want to outline some areas that should be kept clear in order to allow for efficient unloading. Waiting rooms make lots of sense. Some people will be arriving at the station early to catch their train. Some people will have to wait for the next leg of their trip. Sometimes things will be delayed. I used to live at the apartments recently built on Union Station, and the building is one of my absolute favorite buildings in the world. During holidays and most rush hours, the passenger volume is huge - though it's currently efficient enough to handle things easily. 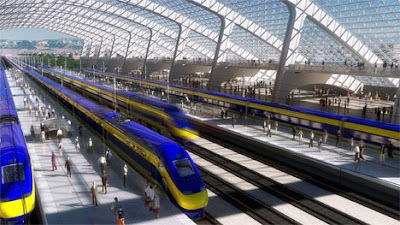 Once HSR is done, LA will have a much large transit network, and Union Station will be an even more vital link. I'm afraid that the current layout won't be able to accommodate all the passengers. A direct connection from HSR/Gold Line/Metrolink platforms will have to be created (stairwell and/or elevator) to ease flow in the central concourse. That's not a problem. But the sheer number of people that will be using the relatively small station will definitely strain the current setup. Keep the stations. So long as they're not pedestrian flow disasters, they're commercial assets. Modelling various degrees of good pedestrian flow is inexact to say the least. If Palo Alto gets a stop, notwithstanding the nimbys, the station should be completely rebuilt. There is a coven of wackos who assert that the current station should be preserved, but that is nonsense. It was an ugly failure the day it was built, and now it is a shabby derilict dangerous ugly failure. In general the old stations are great for HSR use, not because of their historical attributes, but because they are usually in the best locations, because they are beautiful and functional buildings that are already there. SNCF rebuilt Gare de Lyon in Paris with another floor underneath (there was probably a basement already used for baggage as there is in most big US terminals). You are right! And I thank you for putting "beauty" in the equation. There is no reason why we must settle for ugly and functional. One reason that Americans have such a knee jerk reaction to anything new is because invariably our new building are so ugly. No one I've met have ever had a good thing to say about the architecture of the Milbrea station. And if that's the sort of thing we're going to get up and down the line I feel sorry for California. Travel Europe and you'll see countless example of old structures recycled to new uses. This is especially true with public building, train stations being just one example. I hope that communities will show a little pride of place when it comes to their stations. We have an opportunity to create something we can all be proud of. A work of art, not just a railroad. I hope we don't end up with just more ugly utilitarian concrete poured from one end of the state to the other. Look around you, my guess is that the buildings you admire, like those lost stations, were all built along time ago. I don't know about you but I'd much rather start a trip from any of those old lost stations than I would any American airport terminal. In SAC they will integrate the old building into the new. Waiting rooms are good because a lot of arriving passengers have two wait around for their ride to pick them up. Waiting rooms are also a good location for retail revenue. Larger historic existing stations - and keep in mind there aren't going to be that many hsr station anyway.. should be preserved and modified. You will run into problems though - for instance if yo can believe this - the sac station, and you know how miserable summer is there, can not be air conditioned because the hysterical society won't allow it - or any other changes - at all - to the existing structures. So you have hundreds of cranky people waiting for trains in hundred degree heat. They won't even let amtrak change the glaring unpleasant light bulbs. The ridiculous part of it is that its current configuration - isn't even the historic configuration of the building. - its the building configuration after bad and inefficient post rail glory mid century modifications - the historic society there is on drugs. SO there's that to deal with. I also wonder about FNO. 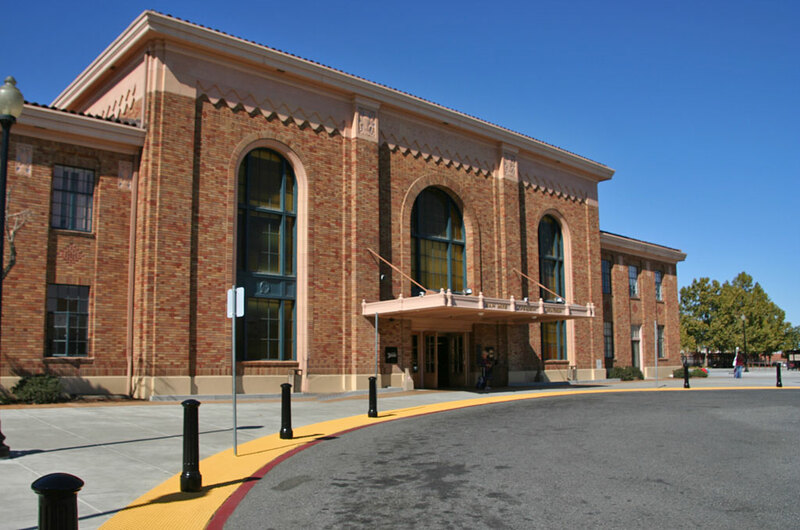 They just re did the historic depot there on the BNSF line, which Amtrak uses, if HSR uses the UP line - there won't be a good transfer point in FNO and FNO is to be THE place where san joaquin local feeder passengers transfer to HSR. I know they didn't just redo the historic station only to not use it anymore. The bigger issue for me though is that I don't think HSR should be wasting money on anyhing grand. I think consider the tight budget Cities and towns who want a station can build something grand if like like - the way san francisco and sacramento are going to do. But chsr should build only the most basic utilitarian stations and platforms. There just isn't enough money to go around building signatures for cities who should doing it for themselves. The money needs to be use to get train up and running properly. As it is now, if a city in california wants amtrak service to stop there, they have to build their own station. I feel transportation hubs, like train stations, Metro Entrances, and the alike, should be place-making locations. In other words, the public considers these locations as an essential and attractive part of the urban environment. And, they go to these places because there is something to do... something to do that is other than hopping on a train to work or across the region or state. Such places become engrained in peoples heads and quickly come to mind when defining their territory or area to visitors. Single-purpose stations... are only 'way points' in a trip. Without something to do, those people that are there tend to dread the experience... because they are waiting for a train and there is little to do. On the other hand, stations that have place-making ability, can draw more people to them for their origional intended purpose... transportation. London's San Pancras station is amazing as a good example. I was there last year at this time. They incorporated a very nice shopping mall underneath the Eurostar platforms... and it's open air.... or so the feeling is. The shops are nice and give something to do for those waiting for a train. The Station as a whole is beautiful and also has some nice artwork and sculptures. I am not saying all HSR stations should be just like London's San Pancras, with a shopping area; however, developing a sense of place that draws people to the station is desirable in my opinion. San Diego's Union Station seems to be on the back burner.... it's not the focus of the Authority like Los Angeles to San Francisco is... so I'll speak to the nearest one ... the Union Station at Los Angeles. Going by the Authority's early June board meeting, on 2 different items they spoke to supporting an aerial station above existing Metrolink and Amtrak platforms and tracks. That's a good place. I think I agree that the view from Alameda Street, that the HSR Station's height above and behind the main entrance to Union Station would have little to zero impact to the view of the station itself. In actuality, the east side of Union Station is equal to, or has more of it... people accessing the station. Lots of buses are now on the east side. And, the Metro Red/Purple lines and Gold line serves the station. Today, lots of people use Metro to get to Metrolink trains. LA is the country's 2nd largest city, after-all! Union Station is a far cry from its condition of 20 years ago... when there were no Metro lines or Metrolink. In fact, east improvements represent quite an effort to revamp and remodernize the station. And, what's there now complements the historic side very well. HSR architects for Union Station should try and do the same. Concerning the insides and functionality of Union Station.... the Main Hall likely will have little use to HSR. The tracks and platforms will be 2 levels above that Hall. With Metrolink and Amtrak platforms and tracks between them, there is little opportunity to fit in the necessary vertical transportation; elevators and possibly ramps. Those tracks and platforms, which already seem narrow, will block them. It seems that a 2nd main hall or access point to platforms from an above location may need to be considered; riders could descend down to the platforms rather than ride up to them. Riders could get access to a new elevated hall from each end, one on the east and one on the west sides of the HSR platforms. At those end locations there is more area available to provide elevators or ramps and so forth. At LA Union Station, the main hall should definitely stay untouched, but the platform area should be redone entirely with an architectural theme that ties in with the Patsaouras Transit Plaza and the Metro administration building. Nah, I prefer the architectural style of rusting canopies. Take a look at Tokyo Station in Japan. They kept the historic headhouse but overhauled the interior so that it can effectively handle hundreds of thousands (millions?) of passengers each day. That's a good idea of what I'd like to see in LAUS or Diridon. Regarding allowing passengers to wait on platforms or in a waiting room- if the platforms are the high type, and possibly built with movable barriers at intermediate stations, there is no reason to keep people sequestered in waiting rooms. Making the platforms wide would provide space for waiting passengers as well as kiosks, snack stands, etc. This is common in Europe and Japan. As for the case of Tokyo Station, passengers spend little time on the platforms as trains are so frequent. There are waiting rooms, but these are seldom used, as most people spend any spare time in the extensive network of shops and restaurants under the platforms and adjacent buildings. Nothing is wrong wil allowing riders to wait on the platform. Transit users all over the world already do so today... and with trains that could be 1400 feet long... with 20 or so doors, and dwell times that could be as few as 20 seconds in some instances, it would be impractical to have them in a holding pattern in a satelite waiting room. Perhaps only in a terminal station would that have any impracticality... keeping riders away from a train while it's being cleaned during an extended dwell. But then, the train could just have its doors kept closed until it's ready for boarding. I'm unsure you were responding to me; however, concerning the main hall in Union Station at Los Angeles, I did not suggest any change be done to the existing at all. I suggested that an additional hall be created atop everything... allowing greater opportunity for vertical access on the ends and to descend down to HSR platforms. In thinking about it more, the hall need not be directly above the existing one too. It could be offset to the south be several feet, on the extreme southern end of the station (nearest US 101), or it could go diagonally... off set, but similar to the subway line several feel/levels below. The latter could minimize the distance between the Metro lines and HSR. I still want to know who is going to pay for the stations in San Jose, Fresno, Bakersfield, Ontario, Gilroy and the others. The cities or the railroad? The does the 40 billion dollar price tag include all these grand designs? Because if it does, and the project comes up short. Something will have to be cut. I think the voters would prefer an affordable functioning system to a lot of grandeur. Why are people saying that there shouldn't be waiting rooms on the platforms? If it's 100F outside, wouldn't you want an air-conditioned waiting room? In Japan, they're always crowded because they protect you from the elements (rain or sun). I'm not saying every station needs them, but I would like to see them in hot and humid areas. BTW, there are also separate rooms for smoking. Waiting rooms ON the platforms? Do you have a picture to illustrate? The platform is the space BETWEEN the tracks; usually 20 to 30 feet wide. A waiting area aways from the platforms may be appropriate... especially at transfer stations. Remember grand place-making stations are cheaper than simple low-cost affairs . . . because they become real estate developments (with the virtue of having a feed of people). With a real estate development partner, these projects are easier than something wholey funded and built by the rail authority. in addition to the main waiting room someplace away from the tracks. And even direct access to the street without passing through the station. Cross platform transfers to another system! Incompatible electrification and if my sources are right different platform heights! Diesel trains that serve low level platforms and Acela all in the same station! Buses! Trolley cars! Taxis! Pedestrians even. It goes by quite fast since the train is still decelerating. 055, Stairwell to Market Street and it's buses. 1:05 More stairs, they may have installed escalators too. The inside of similar waiting room on the platform for tracks 3 and 4. Not much of the waiting room to be seen after the first 15 seconds. Definitely not as lush as the main waiting room but better than the benches out on the platform. Interesting... but applicable? True, teh area does indeed appear to be between tracks; however, it also appears to be a boundary between paid and non-paid areas. The distance also appears a bit wider than what we might expect at HSR stations here. it also appears to be a boundary between paid and non-paid areas. Fare control for PATH. The platform between tracks 3 and 4 look very much the same but there's no fare control on the platform because PATH is a level up on the westbound side. No cross platform transfer but nice wide ramp from the upper level. The building on the platform is only as wide as the stairs leading down to the concourse. The doors in the center are at the top of the stairs. So approximately half the structure you see is sheltering the stairs from the weather. The other half is sheltering passengers from the weather. The distance also appears a bit wider than what we might expect at HSR stations here. Ya get what you pay for. They can slap an HSR logo on some bus shelters and put those on the platforms or they can do something better. Brandon in San Diego said... Waiting rooms ON the platforms? Pretty much every British non-terminus railway station that has waiting rooms has them on the platforms. It's the best place for them, because then passengers will see the tain arriving, and then simply walk out of the waiting room and onto the train. If you have waiting rooms elsewhere, passengers have to move before the train arrives, and then stand around on the platform. Westerly, RI is the closest thing to unknown on the East Coast. Tokyo Station is a great station insofar as getting from the subway to the Shinkansen is concerned. I'm sure millions of passengers travel through the station every day without even noticing the historic facade on the outside. However, it is a disaster as a model for historic preservation. They basically saved just the front part of the old building and destroyed the rest. By Japanese standards, they did a pretty good job, but we could do so much better. Fortunately, the main building at Los Angeles Union Station is far enough removed from the tracks that you could do whatever you wanted with the east end and not affect the front entrance and the waiting room. Put in elevated tracks if that is what is needed. I'd love to see more shops in the general area of Union Station, maybe even more vendors within the confines of the station itself, but that's a topic for another blog. The only thing that bothers me about Union Station is that the passenger drop-off area is already ridiculously inadequate for the traffic that they get. I don't see an easy solution to that problem, however. Hopefully the subway and the Downtown Connector will help take care of that problem, but people who arrive by car will always have a more difficult time of it. Union Station should be preserved. And when I say Union Station, I mean the traditional mission-revival building. The rest of it, the actual platforms and tracks need to be entirely reworked. As many of you have pointed out, there are no run through tracks, connections are difficult and moving around can be difficult. I suggest a complete makeover of the station. This is for sure the most costly proposal, but I think it would be the most effective. This project NEEDS to be thought about in the long run and this station, along with the Transbay terminal will be the two primary stations of the entire system. It has to be done right. An entirely new station should be developed that connects to the historic station. The new station would have three levels, a underground for local trains, a middle concourse with waiting space, and a top level for the CHSR. The concourse would be at ground level. Run-through tracks would run over and under the freeway. The station should also look into expanding it's footprint if necessary. This could include taking over the old post office building (which could become a nice terminal as well) as well as some of the parking lots that surround it. I know those new apartment buildings were just built around Union Station, but (gasp!) those may need to go. Waiting rooms are important. Most important though is to have enough space. Stations get very busy. Penn Station in New York always feel claustrophobic. The ceiling is low and there is no natural light. One of LA's defining attributes is its climate and feeling of openness and airiness. The station should capitalize on this. Union Station in Washington DC is a good example of a successful add-on in the sense that the older station is well and maintained. The newer station desperately needs to be renovated however. It may take a lot in resources, but I think it would well worth while to use LA's Union Station. The existing station building should become basically the front door and foyer, a new station with modern amenities should be constructed around it. The existing platforms and surface parking lots should become a new tri-level depot.